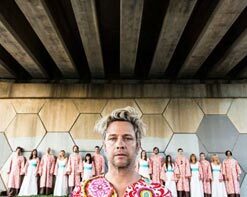 The Polyphonic Spree are many things at once: A band. A choir. An orchestra. A movement. And perhaps most of all, they are a force for good in the world. With strings, brass, guitars, drums, and many voices, this 22-piece “choral rock” group make music that is unabashedly life-affirming, full of hope, and free of irony. It’s a big, bombastic, joyful noise. And while music writers are often too eager to describe a band as “original”, there truly isn’t another band like the Polyphonic Spree on the face of the earth. They are currently touring the world behind their latest album, Yes, It’s True, and HIP Video Promo is delighted to present the gorgeous clip for their newest single, “Hold Yourself Up”. For the uninitiated, this track is a fitting introduction to the widescreen and wondrous sound of the Polyphonic Spree. The solemn and ethereal tones of an organ quickly give way to steady kickdrum dance beat, as the song erupts with driving bass, buzzing and shimmering with the sounds of chimes and EWIs (electronic wind instruments). Lead singer Tim DeLaughter spins a tale about a steadfast and wise female spirit who gives strength to the downtrodden. 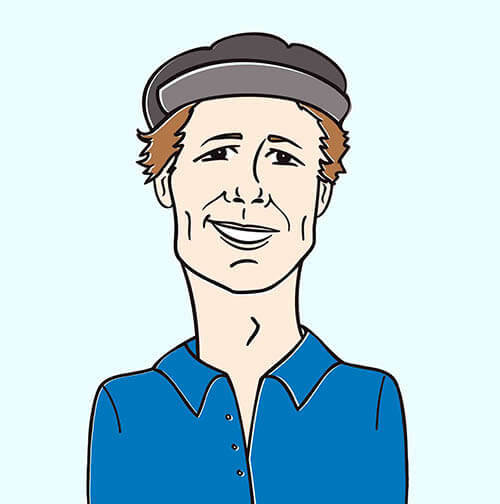 A choir of voices join him for the track’s inspiring and infectious refrain: “Hold yourself up. / Hold yourself up. / Reach into your mind. / (She says) Hold yourself up. / Hold yourself up. / Aim right for the sky.” And while you may not be 100% sure of the meaning, you’ll be singing along anyway and feeling better for it. The video–directed by Justin Wilson–is a beautifully-shot, relentlessly-engaging clip that places the band in its own narrative while perfectly capturing their essence and energy. Beginning with an ominous overhead shot of man face down in a field as another man kneels beside him, you quickly realize the first man was assaulted and the other man is picking his pockets. Then, as the music kicks into gear, the victim finds himself dazed and soaring through space. He awakens in an open field to the vision of six beautiful female singers dressed in white. Rubbing his eyes, suddenly only one remains, and she is running away, prompting him to follow. As he tries to catch up, a pain in his side causes him to collapse. The scene briefly changes to the man on a gurney, bleeding from a wound, as members of the band dressed in doctors’ and nurses’ uniforms attempt to stabilize him. Regaining his strength, he returns again to the field and follows the woman to a barn. In the hayloft, he finds himself among the heady swirl of a heavenly performance by the Polyphonic Spree, as confetti falls, and the band sings, dances, and plays all around him, draped in paisley robes. He is overwhelmed with joy. At the video’s end, however, the pain from his wound pulls him out of that dream, and he finds himself alone. An additional video for the album’s first track, “You Don’t Know Me” finds the band exploring some slightly darker musical tones with an element of defiant determination. This video–directed by Albert Moya–is a strange and haunting clip that features a woman who is seemingly suffering from depression. She languishes in a filthy, cluttered apartment, ignoring a growing batch of voicemails, before suddenly getting herself together and heading out for a night on the town. Upon leaving her building, however, she is transformed into the body of her inner child, and she soon finds herself among a party of similarly transformed children. Tim DeLaughter is also there, solemnly walking around in a three-piece suit. There is some dancing. DeLaughter and the main character are connected somehow, but the video’s unsettling mystery lingers on well after its final frame. We are very pleased to be bringing you more great videos from our friends at Kirtland Records! The band has just embarked on a massive US summer tour and we’d love to hook you up with the chance to catch up and see the show live! For more information on the spectacular Polyphonic Spree, their current tour, or either of these two great clips, please call Andy Gesner at (732) 613-1779 or e-mail the at HIP Video Promo staff at info@HIPVideoPromo.com . You can also visit www.ThePolyphonicSpree.com/ or www.KirtlandRecords.com/ for more info.